Making Greek yogurt produces a lot of whey. 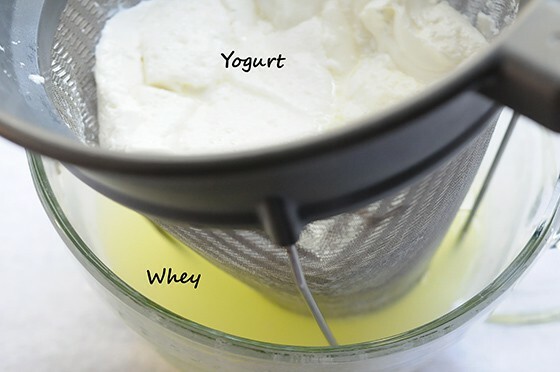 Many people ask, “Can I Use Whey Left Over From Straining Yogurt to Make More Yogurt?” Let’s talk about it. Making yogurt at home is not an exact science, which means it can be accomplished seemingly a million and one ways. If you’ve never tried to make yogurt before, see this post or watch the video below to get started using my method. Can I use whey make more yogurt? YES! Add 2 tablespoons of whey to 2 quarts of heated and cooled milk. (More or less whey may also work–this is just what I do.) Whisk it well and incubate as usual. In the picture above and below, I made the yogurt on the left with whey as the starter. The yogurt on the right was made with my own homemade yogurt as a starter. The results were identical in taste and texture. If you make very much Greek yogurt, you will have more whey than you can use. Look here for more ways to use whey. 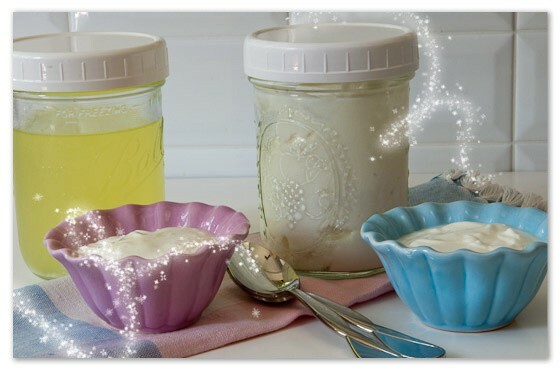 Now you won’t have to “waste” any of your precious homemade yogurt as a starter. Instead, you can enjoy eating every last drop. Always save a little whey to make your next batch so you don’t have worry about keeping some yogurt back to use as starter. It’s easier to mix whey into your heated-and-cooled milk than regular yogurt. No lumps. I also get a lot of questions about the shelf-life of whey. In my experience, it’s good for at least 3 weeks but I’ve read it can last for 6 months. Although it may last longer, since I make yogurt twice a week, there’s no reason for me to keep it around. I make yogurt with the cold start method in the instant pot. I always strain to make Greek yogurt and last time I saved the whey after learning all the different ways to use it. I made a batch of yogurt last night and used the whey for starter and 10 hrs later I only have warm milk 😩. I also used the whey in my homemade mayonnaise which is supposed to give it a shelf life of a few months but it got moldy after a couple weeks. You must be disappointed–and I don’t blame you. I have never tried the “cold start method.” Does that mean you didn’t heat the milk to 180 degrees F and then let it cool back down? If so, I’m probably not qualified to answer this question. I ALWAYS recommend you heat the milk because it rearranges the proteins so the result will be thicker yogurt. Meanwhile, add some yogurt to your “failed” yogurt and re-incubate. I hate to ask this, but did you set your Instant Pot to the yogurt setting? In other words, was the yogurt warm enough to incubate or was it too hot and killed the yogurt babies? Re: mayonnaise. You did keep it refrigerated. Right? Homemade mayonnaise, even with whey will not last more than a month in the refrigerator. Oops! I just read the rest of the comments and see that you answered my question, so please ignore that! By the way, I’ve been using the same starter for nine months now, and it still working great! 9 months? You are doing GOOD!!! Thanks so much for this tip! Using whey works great, and produces an identical result with using the actual yogurt. I’ve started the instant pot to make my yogurt, and it had simplified even more the process! I use my leftover whey in place of water when I bake bread. One question…I’m going to be traveling and am wondering some whey without killing the active culture, so it’s ready when I return in a month. Thanks for all your help! Thanks for the confirmation, Frank. I’m curious. What proportions do you use when adding the whey? Hi. How many times can I keep using my own culture as a starter, whether whey or yoghurt before it loses it’s power. How will I know? That is a VERY GOOD question. I’m not sure I have a very good answer. In general, it’s when your yogurt is not quite up to par, particularly the texture. If your yogurt has a “gluey” texture, definitely start over. If it’s not as thick as usual, I would probably start over. And if the taste takes a turn, start over. I have used the same “culture” for as long as a year. But sometimes I start over after 3-4 weeks. There are so many variables, I don’t think one can go with a hard and fast rule. I often freeze the whey and use it as a starter. It works fine. Whey is a by-product that is produced by straining yogurt. I’m not familiar with kvass so I’m sorry, I can’t answer your question. Love your blog!! Just started on my yogurt adventure. It was a little intimidating at first but truly yogurt is pretty forgiving. Really, clean containers and utensils and mind your milk temperatures are the only musts. At first I would stress about how much yogurt for a starter, how long to hold the milk at 180 degrees and what if it went above 180?? What if I went longer than 10 minutes? And what is the correct temperature to heat it to? or cool it to? Everyone had a different answer… Well I have been at it about a month now…I have heated it as high as 200 degrees, and held the high temperature for 10, 15, or 20 minutes…I use any combination of 2% whole milk, cream 10%, 18% or a splash of 32% (decadent yes), also I love coconut milk yogurt, love the flavor, have made yogurt using pure coconut milk, though that is pricey, but it is only the flavor that I am going for so I throw in a can of coconut cream, splash of cream and fill it up with whole milk…. delicious!! As a result of finding your blog today and your posts about using whey as a yogurt starter there is a coconut/whole milk yogurt on the go as I type … very excited about this because the waste of whey weighs heavily on my mind…couldn’t resist. I tried using whey…. It did NOT work. What went wrong? I have a yogurt maker in which for which I do not do anything to the milk before adding the yogurt starter and pushing start. Do you know if I could use the whey in the machine the same way as I use some of my yogurt as a starter? I would certainly think so. Should be no difference whatsoever. 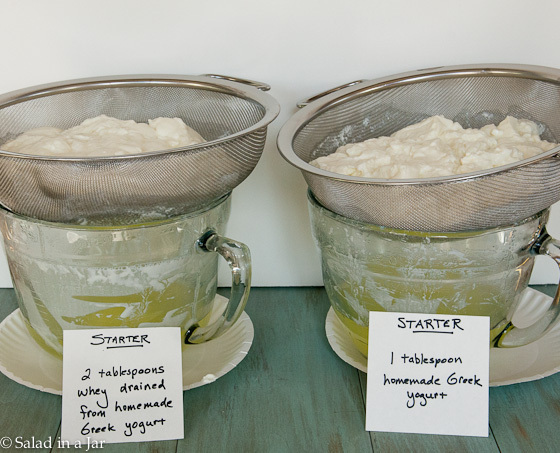 I don’t make yogurt as often as you, so can I freeze the whey and still use it as a starter….at a later date? Although I have never frozen whey, I have frozen yogurt to use as started and it worked great. I can only imagine that whey would also freeze well. In making yogurt from all heavy cream (three pints), would I get enough whey to start another batch? I’ve never made yogurt from heavy cream but it doesn’t take much whey (a couple tablespoons?) to start another batch so I’m guessing you would have enough. Thanks for the tip! I started using whey for the starter last week, and it was perfect! Very interesting experiment. I must try this. And you are right about whey being easier to incorporate into the milk. Love your blog Paula. I am wondering if the whey can be frozen. I live alone (well,with my three dogs:) and it’s a rare happening when I make yogurt and anything else in the same week. I just don’t cook much for just myself, but would love to try using the whey in pizza dough, etc., but like I said, it would probably go bad before I could use it. Yes, you can freeze the whey, Shawna. I have done it for both yogurt and bread making. I also use the whey from making what I call Hungarian cottage cheese. I haven’t tried freezing whey but I have frozen yogurt to use as starter and it works great so don’t see why it wouldn’t be the same for whey. Perhaps you saw in the comments that Judith says, yes, you can do it. I make handcrafted soap and substituted yogurt whey for water in a batch. It was very interesting. The soap smelled like fresh bread and felt lovely on my skin. Making soap? That’s a new one for me. Must add that to my ongoing list of things you can do with yogurt whey. Not only that, you can also use whey as the liquid part in bread making. Gives bread a sourdough taste without having to make a starter. Thanks for the reminder about using the whey in bread, Judith. I especially like it in french bread and pizza dough.